Anarki og anarkisme betyr system og styring uten hersker(e), dvs. samvirke uten undertrykkelse, tyranni og slaveri. En for alle, og alle for en. Graden av anarki er avhengig av graden av sosialisme og autonomi i videste forstand. Graden av kapitalisme er 100% - graden av sosialisme, og graden av statisme er 100% - graden av autonomi. Når graden av autonomi er mindre enn 50% er graden av statisme større enn 50%, dvs. graden av statisme er signifikant. Når graden av statisme er signifikant er det statisme på samfunnsnivå. Når graden av statisme er signifikant (>50%), er det politisk/adminstrativt arki, dvs. et herskersystem aggregert på samfunnsnivå. Dette kan være politisk/administrativt monarki, oligarki, polyarki, etc. dvs. signifikant. Når graden av sosialisme er mindre enn 50%, er graden av kapitalisme større enn 50%, dvs. graden av kapitalisme er signifikant. Når graden av kapitalisme er signifikant er det kapitalisme på samfunnsnivå. Når graden av kapitalisme er signifikant (>50%), er det økonomisk arki, dvs. herskersystem på samfunnsnivå. Dette er økonomisk pengevelde og rikmannsvelde, plutarki, dvs. signifikant aggregert på samfunnsnivå. Når graden av sosialisme og autonomi er signifikant (>50) er det anarki, dvs. signifikant aggregert på samfunnsnivå. Da er graden av kapitalisme og statisme usignifikant, dvs. mindre enn 50%. Graden av arki er da usignifikant, dvs. mindre enn 50% både politisk/administrativt og økonomisk, og det er anarki, ikke arki/stat/regjering/autoritet. ( 1 ) Anarchies vs archies. Societal, political-economical systems, including organizations and political tendencies; economical, political or politological, sociological and anthropological systems, may be anarchies or the negation of anarchy = archies. Thus the total amount of societal systems S = anarchy + archy <=> S = anarchies + archies. Anarchy = anarchism, with respect to societal systems broadly defined. ( 2 ) Archies may be expressed as x-archy, where x is one of a set of systems characteristics of archs, say, ( mon, olig, poly, plut, ochl, matri, patri, hier, etc; but not an) or a logical union of several x-es reflecting different forms of archy/archies as opposed to anarchy/anarchies, i.e. the negation of x-archy = archies. ( 3 ) Possibility of anarchy. It is assumed that these terms reflect concepts that may be defined in a way that anarchy is not impossible in reality, i.e. the amount of anarchies in real terms is greater than the empty set, zero. Anarchy is matter of degree = tendency. Anarchy, i.e. an anarchist social system, may have 100% or a significant degree of anarchy, i.e. less than 100%, but above a given significant level. ( 4 ) Significant anarchist tendency = anarchy. As anarchy is the negation of x-archy it may not have any amount, i.e. significant tendency towards or of x-archy. Thus anarchy may have zero or insignificant tendency towards or of archies. The significant level is defined on aggregated dimensions. ( 5 ) Dimensions: a) There are an economic dimension and a non-economical dimension in societal, political-economical, system context: One aggregated economical, and one aggregated non-economical dimension, i.e. political/administrative rank broadly defined. Empirically this reflect economic remuneration and political/administrative rank of organizational social systems' maps broadly defined. b) The economical dimension measures socialism vs capitalism, where the degree of capitalism is the tendency towards or of economical archies (x-archy) and the non-economical dimension is autonomy vs statism, where the degree of statism is the tendency towards or of political/administrative archies. c) Along these two dimensions different forms of anarchy and archies (x-archy), are measured and mapped. The degree of socialism = 100% - degree of capitalism. The degree of autonomy = 100% - degree of statism. Socialism and autonomy are defined as insignificant degree of capitalism and statism respectively, and capitalism and statism is defined as significant degree of statism and capitalism respectively. Thus, socialism and autonomy are defined as significant degree of socialism and autonomy, and capitalism and statism are defined as insignificant degree of socialism and autonomy respectively . ( 6 ) Anarchism and other -isms. Anarchy is the negation of archies related to the economical and political/administrative dimensions, i.e. socialism and autonomy. Capitalism is economical plutarchy, including hierarchy and may be other x-archies broadly defined in an economical context. Statism is political/administrative monarchy, oligarchy, polyarchy, ochlarchy (mob rule), the archies of rivaling states within the state, i.e. chaos; and the tyranny of structurelessness i.e. disorganization, and/or political plutarchy, and it may also include other archies, say, being matriarchy, if the main rulers are women. 4. plutarchy without statism = liberalism. Archies (x-archy) are defined equal to authority and State/government in societal context. Thus authority and State/government in societal context are liberalism, fascism and marxism broadly defined. And thus anarchy and anarchism are systems without any authority and State/government, in societal context, i.e. economical and political/administrative, also called political broadly defined. These societal, political concepts of state/government and authority, must not be mixed up with statism and the authoritarian degree, as defined related to economical-political mapping. Furthermore insignificant tendency towards or of State/government is not State/government, and insignificant tendency towards or of authority is not authority, but anarchy and anarchism. ( 7 ) Significant level at 50%. Anarchy has less than 50% tendencies towards or of archies, x-archy, aggregated on the two relevant dimensions, on a scale from 0 => 100%. Thus more than 50 % tendencies towards or of archies, x-archy of relevant x-es, aggregated on the economic and/or the non-economic dimension, are not anarchist, not anarchy. Thus anarchy has 100-50% degree of socialism and 100-50% degree of autonomy, and archies have less of one or both, i.e. more than 50% degree of capitalism and/or statism. ( 8 ) Anarchy defined: Anarchy and anarchism mean system, coordination and management without ruling and rulers (not without rules). i.e. co-operation without repression, tyranny and slavery, and archies mean system, management and coordination with ruling and rulers, i.e. the negation of anarchy and anarchism. From greek 'an', as in anaerobe vs aerobe, i.e. keeping what is essential of the object, (in this case system, management, coordination) but without the special characteristic mentioned in the suffix, i.e. 'arch', ruling and ruler(s), from archos (ruler) and archein (ruling, being first). ( 9 ) Not totalitarian: The question of anarchism and anarchy vs archies is limited to the societal political-economical systems' management and coordination. What is interesting in anarchist perspective is whether or not the economical-political system has authority, i.e. ruling and rulers - or not, with respect to the societal managent and coordination. Other uses of the words anarchy vs x-archy and anarchies vs archies are principally irrelevant to anarchism, and should in general be avoided. (10) Not valid concepts. Concepts as anarcho-archy = anarchy-x-archy in any form, meaning system, coordination and management "both with and without ruling and rulers" at the same time and place, are not allowed for, because such concepts are contradictive, and thus are nonsens and not logical and scientifical, because this is in reality not possible, and anarchism and anarchy is about realities. Thus anarcho-marxism, anarcho-capitalism = anarchy-plutarchy, anarcho-ochlarchy, anarcho-chaos, anarchy = chaos, anarchism = anarchy = minimal state or libertarian state, state in general, anarcho-statism, anarcho-authority, etc, are nonsens and not valid concepts, but confused Orwellian "1984" "newspeak" that is not anarchist, but authoritarian, i.e. chaotic, and should be avoided. Vi skal sammenfatte og utdype dette noe. Anarki betyr altså også signifikant grad av både sosialisme og autonomi (>50%). Dette er det sammme som å si at det er betydelig økonomisk og politisk/administrativ frihet og demokrati i samfunnet når det er anarki. Signifikant grad av sosialisme er sosialisme og signifikant grad av autonomi er autonomi. Da er det følgelig både sosialisme og autonomi når det er anarki og anarkisme. Et herskersystem - arki - inntreffer først når graden av enten sosialisme eller autonomi er usignifikant (<50%). (Graden av kapitalisme er 100% - graden av sosialisme og graden av statisme er 100% - graden av autonomi). Dette er følgelig det samme som at enten kapitalisme- eller statisme-graden er > 50%. Da er det enten statisme eller kapitalisme (eller begge deler) som hersker. Da er det altså arki - ikke anarki. Arkier kan være marxisme, fascisme eller liberalisme. Motsatt dette er anarki (anarkisme), jevnfør det økonomisk-politiske kartet. *) Stjernene på kartene markerer posisjonen til det norske økonomiske-politiske systemet (ca 53% anarkigrad) etter den revolusjonære endringen i 1994/95. Les mer om dette på Anarki i Norge m.v. og IJA 1994-96. Systemet er i dag plassert like over stjernen på kartet med ca 54% anarkigrad. I et anarkistisk system kan det være tendenser henimot herskere, men egentlig ikke ordentlige, reelle, herskere (dvs. av en betydelig grad - signifikant), på aggregert samfunnsmessig plan. Dette er igjen avhengig av innflytelsen på styringen av samfunnet/landet. Dersom innflytelsen på styringen går mer nedenfra - fra folket - og opp, enn ovenifra og ned - fra øvrigheten, både økonomisk og politisk/administrativt, da er det anarki (reelt demokrati, realdemokrati) . Motsatt, går innflytelsen på styringen mindre nedenfra - fra folket - og opp, enn ovenifra og ned - fra øvrigheten, økonomisk og/eller politisk/administrativt, er det arki (ikke reelt demokrati). Det er altså grader av anarki, avhengig av hvorvidt innflytelsen på styringen går mer eller mindre nedenfra og opp kontra ovenifra og ned. Dette tilsvarer at graden av anarki vil avhenge av hvor sosialistisk og autonomt systemet er. Er systemet både 50% autonomt og sosialistisk, får vi midtpunktet på på det økonomisk-politiskek kartet. Da er graden av anarki 50%. På toppen av kartet har vi det anarkistiske ideal, med en anarkigrad på 100%. Mellom disse punktene innenfor den anarkistiske kvadranten på kartet, vil anarkigraden ligge mellom 50% og 100%. Anarkigraden, som kun er definert innenfor den anarkistiske kvadranten, er også 100% - autoritærgraden, som måler avstanden fra toppen på det økonomisk-politiske kartet. Dette kan utrykkes ved følgende formler. In general, for the whole map, the authoritarian degree is used, i.e. 100% minus the libertarian degree. If the authoritarian degree is not significant, i.e. less than 50%, outside the anarchist quadrant, the term semilibertarian, or semidemocratic, system is used. Anarki og anarkisme betyr som nevnt system og styring uten hersker(e), dvs. samvirke uten undertrykkelse, tyranni og slaveri, praktisk talt. Praktisk talt betyr igjen helt eller nesten. Vi har tatt med "nesten" i definisjonen fordi i at anarki av lav grad, som i Norge etter 1994/95, kan det forekomme noe narkotikaslaveri og "lønnsslaveri". Regulært slaveri utelukkes naturligvis fra anarkidefinisjonen. Anarki og anarkisme innebærer altså et system praktisk talt, dvs. helt eller nesten, uten hersker(e), - mer presist uten signifikante, betydelige, herskere. Det kan altså være styrer(e) som er "nesten-herskere" i betydningen ubetydelige, usignifikante herskere (på samfunnsplan) i et anarkistisk system. Anarki betyr altså mer presist et system uten signifikante herskere aggregert på samfunnsplan. Reelle, virkelige herskere, er signifikante herskere. Ubetydelige, usignifikante herskere, regnes ikke som reelle herskere i anarkistisk forstand. De er bare nesten herskere, hvor altså herskere betyr de signifikante, sett aggregert på samfunnsplan. Hvis, og bare hvis enten graden av kapitalisme eller statisme > 50% i et system, er det herskere i denne forstand på samfunnsplan. Legg merke til at autoritærgraden kan være under 50% selv om det er herskere (signifikante) tilstede. Dette skjer i semilibertære, også kalt semidemokratiske, systemer, dvs. systemer til høyre og venstre for den anarkistiske kvadranten på kartet, med autoritærgrad < 50%. Innenfor den anarkistiske kvadranten er imidlertid autoritærgraden et slags mål for den samlede tendensen til "nestenherskere" i systemet, sett aggregert på samfunnsplan. Systemer på grenselinjene til den anarkistiske kvadranten regnes som anarkier. Systemer på grenselinjen mellom den marxistiske og fascistiske kvadranten regnes som marxistiske. Systemer på grenselinjen mellom den liberalistiske og fascistiske kvadranten regnes for liberalistiske. Usignifikante herskere, herskere som ikke er reelle hersker, dvs. styrer(e) som er nesten-herskere, kalles vanligvis x-arkister i stedet for x-arker, hvor x kan være mon, plut, olig, poly, okl, matri, patri, etc, men ikke "an". Dette gjøres for å oppnå en mer logisk begrepsdannelse og ordbruk, i det anarkier, dvs. systemer i den anarkistiske kvadranten på det økonomisk-politiske kartet, ikke har herskere (dvs. reelle - aggregert på samfunnsplan). Kaller man slike x-arkister for x-arker (usignifikante sett aggregert på samfunnsplan), så kan det oppstå misforståelser, og tilsynelatende selvmotsigelser, i det det blir snakk om hersker(e) (usignifikante) i et system uten hersker(e) (signifikante). Disse misforståelsene vil oppklares når man trekker inn det med signifikans, men dette bør likevel unngås. Når det går klart fram at det er et lokalt og eventuelt kortsiktig fenomen, og ikke aggregert på samfunnsplan, kan man likevel bruke betegnelsene x-ark(er), der det faller naturlig, selv i et land som er et anarki. Poenget er altså at disse autoritære tendensen ikke er signifikante på samfunnsplan, dvs. når en ser hele systemet under ett. Rema-Reitan og (tidligere) Rimi-Hagen og andre rikinger kan man vel kalle både økonomiske plutarkister og kanskje også plutarker, pengeherskere, spesielt om de blåser seg opp, men det betyr ikke at Norge er et økonomisk plutarki, som f.eks. USA er på samfunnsplan, når hele det norske systemet er sett under ett, aggregert. Rikingene utgjør en del av de autoritær tendensene, men disse er ikke det signifikante på samfunnsplan her til lands. Rikingene i Norge er for tiden ikke virkelige, relle, dvs. signifikante plutarker, sett i historisk og internasjonalt perspektiv. Rikingene i Norge er i høyden nesten-herskere. Men som et lokalt fenomen, og der og da - temporært, kan plutarkister og kanskje også plutarker, som antydet over, være et relevant begrep. Det betyr altså ikke at Norge er et "anarki-arki", som er en selvmotsigelse, når systemet betraktes under ett. Systemet i Norge er som nevnt signifikant anarkistisk, og da er det anarki - ikke en form for arki. Anarki og anarkisme er altså et typisk gradsspørsmål der graden av anarki kan variere mellom 50% og 100%. Dette betyr at det kan være ganske mye autoritære tendenser i et anarki av lav grad. Men de samlede autoritære tendenser på samfunnsplan må ikke være signifikante, dvs. > 50%. For da opphører systemet å være anarkistisk. Ingen systemer innenfor den anarkistiske kvadranten har autoritærgrad > 50%, dvs. signifikant på samfunnsplan. Legg merke til at autoritærgraden er et aggregat på samfunnsplan når systemet i et land skal belyses. Autoritære tendenser kan ramme mer eller mindre ulikt. Om en person blir drept eller helt invalidisert av et brutalt overfall/ran, er dette en meget kraftig autoritær tendens som rammer lokalt og temporært. Også andre mobbofre kan bli hardt rammet av lokalt oklarki, pøbelvelde. Oklarkene kan altså være høyst signikante sett lokalt og der og da. Dette samme gjelder generelt for x-arker, hvor x kan være mon, plut, olig, poly, okl, matri, patri, etc, men ikke "an". Det betyr likevel ikke at dette er det signifikante på samfunnsplan, sett aggregert i Norge. Det finnes en rekke autoritære tendenser, dvs. tendenser til statisme og kapitalisme bredt definert. Alt dette inngår i autoritærgraden på samfunnsplan. Slike forhold drar naturligvis autoritærgraden på samfunnsplan opp, er ikke akseptable og må motarbeides og kompenseres hvis mulig, men dersom de autoritære tendensene samlet ikke utgjør en signifikant tendens aggregert på samfunnsplan, vil det altså likevel kunne være anarki av lavere grad for samfunnet sett under ett. Når autoritærgraden, eller rettere sagt sosialisme og autonomigraden i et samfunn, skal fastsettes - er kalibreringen av kartet viktig. Her må en se historisk og internasjonalt på forholdene, da anarki av lav grad er et noe relativt begrep. Målt opp mot virkelige herskere på samfunnsplan, f.eks massemordere som Hitler, Stalin og Pol-Pot, blir det et visst rom for "nestenherskere" selv om det er en del fæle, autoritære folk i et samfunn. Det kan altså være anarki (av lav grad - nær 50%), selv om samfunnet er temmelig langt fra idealanarki (anarkigrad = 100%), hvor autoritærgraden er null. En kan merke seg at selv om autoritærgrad = 0, anarkigrad = 100%, kan det være et minimalt hierarki f.eks i form av delegert demokrati, som kombineres med folkeavstemninger. Dette betyr at selv i idealanarkiet behøver ikke samfunnet være helt klasseløst, i det de som har delegert styring, er en slags mild form for øvrighet. Det kan være små rangs- og lønnsforskjeller, men de må være relativt ubetydelige. Innflytelsen fra folket, nedenfra og opp, kan likevel prinsipielt være 100% i idealanarkiet med en anarkigrad på 100%. I praksis kommer man vel aldri opp på 100% anarkigrad, dels fordi det krever en fantastisk høy og miljøvennlig teknologi, dels fordi anarkidealet er som horisonten, når man nærmer seg den, dukker en ny opp. Dette har igjen sammenheng med at frihetsbegrepet definert langs økonomiske og politisk/administrative dimensjoner, aldri lar seg bestemme 100%, - det vil alltid kunne komme til nye aspekter. Graden av statisme i samfunnet er 100% - graden av autonomi og graden av kapitalisme er 100% - graden av sosialisme. Graden av statisme vs autonomi går på hele den politisk/administrative dimensjonen i samfunnet, alt som er systemrelevant utenom den økonomiske dimensjonen, som går på graden av kapitalisme vs sosialisme. Autonomi kontra statisme og sosialisme kontra kapitalisme skal derfor oppfattes i meget vid forstand som de helt vesentlige egenskaper ved et økonomisk-politisk system. Statisme har bl.a å gjøre med kontroll og sentralistisk planlegging etc basert på en sentralisert, autoritær stat, mens autonomi dreier seg om selvregulering, selvbestemmelse, selvstendighet, selvstyre for folket. Autonomi dreier seg om politisk/administrativ frihet, likhet, solidaritet, etc. for folket. Autonomi betyr også at innflytelsen på styringen går mer nedenfra og opp, fra folket, en ovenifra og ned, fra øvrigheten, i politisk/administrative spørsmål i vid forstand. Men begrepet går videre enn dette og skal sees i meget vid forstand. Stor autonomi har således med lang levelengde, utdanning, godt livsmiljø, for folk flest - og små rangsforskjeller - å gjøre. Sosialisme har med høy levestandard og små økonomiske forskjeller å gjøre, slik at det materielle grunnlaget for folk flest er godt. Sosialisme er "kaker til kaffen" også for de relativt minst bemidlede i samfunnet. Sosialisme dreier seg om økonomisk frihet, likhet, solidaritet, etc., for folket. Sosialisme betyr også at innflytelsen på styringen går mer nedenifra og opp, fra folket, enn ovenifra og ned, fra øvrigheten, i økonomiske spørsmål. Det er som nevnt grader av autonomi vs statisme og sosialisme vs kapitalisme. Er graden av sosialisme (= 100% - graden av kapitalisme) > 50% er systemet sosialistisk (signifikant). Er graden av autonomi (= 100% - graden av statisme) > 50% er systemet autonomt (signifikant). Er graden av autonomi og sosialisme > 50% er systemet anarki og anarkisme. 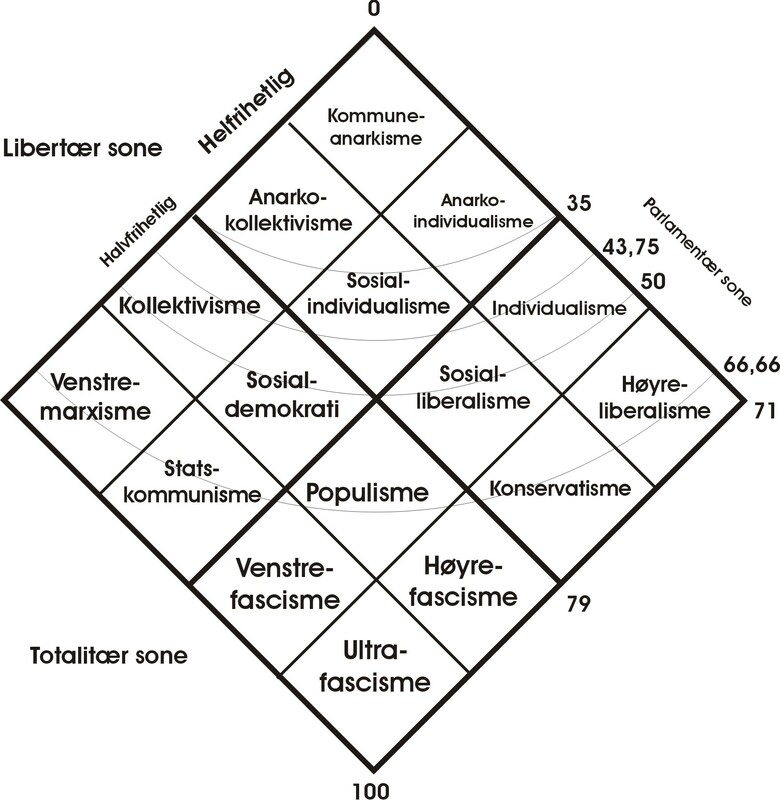 Er graden av statisme og sosialisme > 50% er systemet marxisme. Er graden av autonomi og kapitalisme > 50% er systemet liberalisme. Er graden av statisme og kapitalisme > 50% er systemet fascisme. En kan altså innenfor denne økosirkiske begrepsrammen a) ikke definere graden av sosialisme og autonomi uavhengig av de respektive demokrati-gradene, og b) (signifikant) hersker(e) er definert ved at enten graden av sosialisme eller graden av autonomi < 50%. Hersker(e) er presist ikke definert på noen annen måte, og heller ikke demokrati. Man kan imidlertid vagt, som en første tilnærming, definere demokrati og hersker(e) uavhengig av sosialisme og autonomigraden. F.eks demokrati har å gjøre med at "systemet leverer det folket ønsker", økonomisk og politisk/administrativt, på en frihetlig måte. Sosialisme har med "økonomisk frihet, likhet og solidaritet å gjøre". Autonomi har med "politisk/adminstrativ frihet, likhet og solidaritet å gjøre". Hersker(e) har "noe med slaveri og tyranni og gjøre". Anarkigraden blir estimert ved anarkiformelen, se over, på bakgrunn av estimater for sosialisme og autonomi. Hvordan dette gjører økonometrisk/sosiometrisk operasjonelt er nærmere drøftet i kapittel V.B på Systemteori og det økonomisk-politiske kartet, og vi skal ikke gå i dybden på dette her, bare antyde at graden av sosialisme oppfattes som en funksjon av effektivitet målt med levestandard og inntektslikhet (lav gini-indeks), og graden av autonomi som en funksjon av levelengde, utdanning og rangslikhet. Levelengden skal her være kvalitetsikret, dvs. gi et mest mulig meningsfylt liv med godt stell og høy trivsel inntil man dør. En har altså på denne måten forsøkt å unngå at den aggregerte målfunksjonen for anarkigraden blir et aggregert gjenomsnitt analogt med et mål for gjennomsnitts-temperaturen hvor en person har føttene i en heit steikeomn, og hodet i en iskald fryser, men hvor gjennomsnitts-temperaturen overflatisk sett ser bra ut, slik som i FNs Human Development Index (HDI). En gjennomsnittsindikator tilsvarende HDI, for anarkigraden er ikke akseptabel og brukbar. Poenget er at skal man bruke den økosirkiske og begrepsmessige rammen som følger av det økonomisk-politiske kartet, så må hersker(e) og økonomisk og politisk/administrativt demokrati-begrepene kokes ned til definisjonene av autonomi og sosialisme respektive. Det sier seg selv at da må disse bli temmelig brede og sammensatte definisjoner som inneholder mange fasetter langs den økonomiske og politisk/administrative dimensjonen. Det holder f.eks ikke med egalitet, rangs og inntektslikhet, alene. Sosialismebegrepet må ta opp i seg relevante elementer av økonomisk demokrati-begrepet og hersker-begrepet, ellers holder ikke økosirken, som skal være tilnærmet selvinnlysende for å være riktig. Autonomibegrepet må ta opp i seg relevante elementer av politisk/administrativt demokrati-begrepet og hersker-begrepet, ellers holder ikke økosirken, som skal være tilnærmet selvinnlysende for å være riktig. Dette impliserer også at selve innholdet i den økonomiske og politisk/administrative dimensjonen må være temmelig bredt og mangfoldig, i tillegg til at de skal være uavhengige, så ortogonaliteten, det at aksene står i rett vinkel med hverandre, avspeiler reelle forhold. Foreløpig har man bare kommet fram til forholdsvis grove operasjonelle definisjoner innenfor den økosirkiske, definitoriske rammen gitt ved det økonomisk-politiske kartet. Det gjenstår mye forskning før en kan si seg fornøyd på dette feltet. Man har likevel kunnet trekke visse konklusjoner angående systemers koordinater, men disse er da forbundet med en del usikkerhet. Man kan også teste om hypoteser om et systems koordinater er riktige, med en viss grad av usikkerhet. F.eks. LA-Times hypotese "So this is heaven: Norway ", fra november 2001, se Amerikansk synspunkt på Norge, som kan presiseres til en påstand/hypotese om at Norge var tilnærmet 100% anarkistisk dette året, må forkastes, da relevant statistikk m.v. klart tyder på at Norge bare var ca 53% anarkistisk i 2001. Økosirk er teoretisk praktisk talt sikre sammenhenger, tilnærmet selvinnlysende, men de er ikke tautologier i matematisk-logisk forstand og ikke absolutt, 100%, sikre. Operasjonelle definisjoner kan ha mer eller mindre reliabilitet, validitet og relevans, og også mulige statistiske svakheter kan gi økt usikkerhet. Et godt eksempel på et anarkistisk samfunn av lav grad er Norge etter 1994/95. Anarki betyr som nevnt system og styring uten hersker(e), dvs. samvirke uten undertrykkelse, tyranni og slaveri - helt eller nesten. Norge er et moderat anarki - en årsak til at det er et av de beste land i verden å leve i. At Norge er relativt anarkistisk har blant annet sammenheng med at vi har et relativt egalitært samfunn i lønn og rang, og at det er en høy gjennomsnitts levestandard, utdanning og levealder. Hverken kongen, statsministeren, eller de norske pengetoppene kan sies å være virkelige herskere i historisk og internasjonal forstand. Vi er heller ikke i virkelig betydelig grad underlagt fremmed makt, eller undertrykker og utbytter andre land. Dette betyr alt i alt relativt stor frihet økonomisk og politisk/administrativt for innbyggerne flest. At Norge er et moderat anarki betyr derfor også at vi har et relativt frihetlig samfunn - systemet heller når alt kommer til alt litt over i sosialisme og autonomi, selv om det også er nokså kraftige tendenser til statisme og kapitalisme. Norge er derfor ikke noe ideal-anarki, et frihetlig paradis med bortimot 100% anarkigrad, men likevel et fungerende anarki, riktignok av lav grad - estimert til ca 54% anarkigrad for tiden. Tallet er naturligvis noe usikkert, men angir likevel en sannsynlig tendens. Dette betyr imidlertid også at det er klare autoritære tendenser å stri med, dvs. 100%- ca 54% = ca 46% autoritærgrad. Norge startet opp i 1945/46 etter krigen som et marxistisk sosialdemokrati med en betydelig grad av statisme og sosialisme. Siden beveget systemet seg sakte i frihetlig retning og ble a) anarkistisk, ca 53%, i 1994/95, etter folkeavstemningen mot EU, som b) tok knekken på det marxistiske matriarkiet, med ja-dronning Gro Harlem Brundtland i spissen. Matriarken Gro abdiserte de facto som hersker etter folkeavstemningen, og fortsatte som en svakere administrator til hun gikk av. Norge har ikke hatt noen klare, reelle, herskere etter dette, men er overlatt til anarkiet, som råder OK.
Systemet er sosialindividualistisk, en anarkistisk styreform av lav grad, som a) ligger til høyre for det avanserte marxistiske sosialdemokratiet, men b) litt til venstre for liberalismen, på det økonomisk-politiske kartet, og c) ganske langt fra det anarkistiske ideal på toppen av kartet (se dette ovenfor). Fra 1994/95 til 2002/3 beveget det norske systemet seg fortsatt litt i frihetlig retning, men også noe videre mot høyre, og ble registrert til ca 54% anarkistisk i 2002. Etter 2005 har systemet bevegt seg litt mot venstre, men anarkigraden er per 2010 fremdelses ca 54%. Estimatet er som antydet noe usikkert, men tallet er temmelig sikkert over 50%, så Norge er signifikant, betydelig, anarkistisk siden 1994/95. Dersom ikke noe uforutsett betydelig autoritært skulle inntreffe vil styreformen i det norske samfunnet fortsatt være anarki lenge framover. Anarkistisk organisering betyr at innflytelsen på styringen av samfunnet alt i alt går mer nedenfra og opp, > 50%, fra folket, enn ovenifra og ned. Det motsatte, at styringen går mer ovenifra og ned, > 50%, enn nedenifra og opp, er det anarkistene forstår ved et system basert på hersker(e) = regjering = autoritet = stat i sosial forstand. Man legger ikke noe annet i disse ordene enn styring basert på herskere, dvs. autoritær, udemokratisk styring. Man er således ikke motstandere av staten i betydningen sentraladministrasjonen, av regjeringen i betydningen statsrådet, og av autoritet i betydningen kompetanse, så lenge innflytelsen på styringen går mer fra folket nedenfra og opp, > 50%, enn ovenifra og ned, dvs. at det er reelt demokrati. Er det slik er det altså ikke stat, autoritet, og regjering i anarkistisk forstand. I motsatt fall, om innflytelsen på styringen går mer ovenifra og ned, > 50%, enn nedenfra og opp, er det altså hersker(e) = regjering = autoritet = stat i sosial forstand. Anarki kontra stat. Det moderne stats og anarkibegrepet vs Webers utdaterte m.v. En oppsummering. 1. I følge sosiologen Max Webers utdaterte, gammeldagse definisjon, er en stat den institusjonen som har monopol på legitim bruk av vold innenfor et avgrenset område, og "anarki" er det som skjer ved fravær av dette. 2. Dette står i motsetning til det moderne, oppdaterte, statsbegrepet hvor stat i bred samfunnnsmessig forstand er et system med signifikante rangs- og/eller inntektsforskjeller, signifikant politisk/administrativt og/eller økonomisk hierarki, dvs. betydelig vertikalt organisert, herunder topptungt, byråkratisk og/eller ineffektivt. 3. Og anarki er fravær av dette, et system med signifikant små rangs- og lønnsforskjeller, pluss effektivitet, dvs. betydelig horisontal organisasjon. 4. Det moderne stats- vs anarkibegrepet har således ikke noe med voldsmonopol eller fravær av dette å gjøre. Ingen ekte anarkist anbefaler å ha flere konkurrerende/rivaliserende voldsforetak, men voldsapparatet skal være under deltakende demokratisk styring, reelt demokrati. I anarkier av høy grad vil dette være direkte demokrati, i anarkier av lav grad, er det mer eller mindre delegert demokrati. Norge og Den Sveitsiske Konføderasjon er som kjent anarkier av lav grad, jevnfør 3.. Begge steder er voldsapparatet under reell demokratisk styring. En kan likevel merke seg at i begge land er det flusst med håndvåpen i private hender, som ikke er en del av sentraladministrasjonens volds-apparat, men dette går stort sett bra, og kan bidra til å hindre et statskupp, om noen skulle forsøke seg. Webers "anarki"-begrep har ikke noe med anarki, reelt demokrati, å gjøre. Webers "anarki" dreier seg om rivaliserende polyarki (mange herskere) eller oligarki (fåtall herskere), kombinert med oklarki (pøbelvelde) og kaos ("stater i staten" i innbyrdes strid). Dette er betydelig autoritært, og langt fra anarki på det økonomisk-politiske kartet. Man skal i denne sammenheng snakke om mislykte stater, og dette er ikke anarki, men klart stater - arkier. Anarkistene tar derfor sterkt avstand fra enkelte ordbøker og leksika som definerer anarki som kaos, lovløse tilstander, pøbelvelde, mangel på organisasjon, etc. Dette er er helt feil ordbruk. Og anarkistene unngår derfor denne ordbruken. Det bør også alle andre gjøre. skjer det et kvalitativt skift for et samfunn, fra stat til anarki, dvs. mer enn 50% anarkigrad (autoritærgrad mindre enn 50%), og så videre til 100% anarki (autoritærgrad lik 0%) etter hvert som samfunnspyramiden bredt definert blir flatere og flatere. Konvensjonelt defineres også "tippepunktet", 50% anarkigrad, som anarki. Dette er midtpunktet på det økonomisk-politiske kartet. Når det er anarki er det reelt demokrati, når det er stat er det semi- eller pseudo-demokrati eller enda verre, noe totalitært, med mer enn 666 promille (ca 67%) autoritærgrad. 6. Således gjelder at a) når den samfunnsmessige pyramiden er topptung, betydelig vertikalt organisert, i privat og offentlig sektor, er det stat, og b) når den samfunnsmessige pyramiden er betydelig flat, signifikant horisontalt organisert, i privat og offentlig sektor, er det anarki, i større eller mindre grad. Stat definert i følge 2. har følgelig prinsipielt ikke noe med offentlig sektor å gjøre, er denne innenfor rammen av horisontal organisasjon er det anarki, selv om offentlig sektor er stor. Og en stor privat sektor som er betydelig hierarkisk organisert, økonomisk og/eller politisk/administrativt, kan bidra til - og inngå i - en stat, definert ved 2..
7. Anarkistene holder seg stort sett til de moderne stats- kontra anarki-begrepene, henholdsvis 2. og 3., spesielt i samfunnsvitenskapelig sammenheng, og også i populariserte utgaver. Det bør også alle andre gjøre. 8. Stat er imidlertid et tvetydig begrep. Det brukes også som a) et navn på et land som helhet, "staten Norge", og om b) sentraladministrasjonen, "den norske stat", og tilhørende næringsvirksomhet, som NSB, Norges Statsbaner. 9. Når anarkistene snakker om ikke-stat, fravær av stat, avskaffe staten, o.l., er det stat i betydningen 2. som gjelder, ikke 8. a) og b). At sentraladministrasjonen, stat i betydningen 8 b), kan bidra til en viss autoritærgrad er en annen sak, men anarkistene går ikke inn for å avskaffe sentraladministrasjonen som sådan. Er denne innenfor rammen av horisontal organisjon er den i samsvar med anarkismen. Anarkistene bruker helst ordene "land" og "sentraladministrasjon" i stedet for henholdvis stat i betydningen 8 a) og b), for ikke å skape forvirring. I enkelte tilfeller brukes stat i betydningen 8 a) eller b) når det går klart fram av sammenhengen hva som menes, eller man presiserer nærmer hva som menes, for å unngå misforståleser. Det bør også alle andre gjøre. 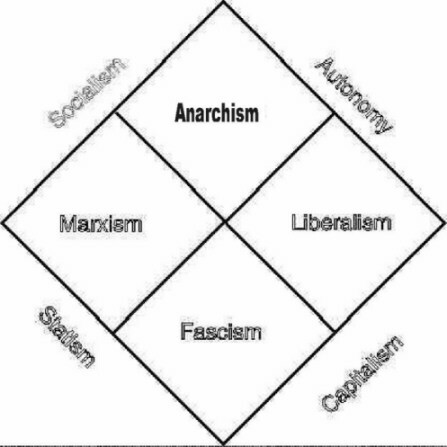 Anarchism and anarchy are socialism plus autonomy as defined above, see the economic-political map, a system significantly flat organized both economic and political/administrative, efficient and fair, without top heavy pyramid economically and/or political/administrative, based on significant statism and/or capitalism. The results of the economic-political systems of the anarchies Norway, the Swiss Confederation and Iceland confirm the basic libertarian hypothesis that a horizontal structure, i.e. a significant autonomous and socialist system, is efficient and fair. Empirical data of other systems confirm that a top heavy structure, capitalist (economical plutarchist) and/or statist, is unfair and/or inefficient.